You are here: Home / Health and Safety Management / What does Safecontractor assessment involve? All responsible businesses and organisations are aware of the importance of adhering to strict health and safety regulations. The need to keep employees, associates and sub-contractors safe from harm whilst on business premises or in the course of carrying out contracted work is paramount in this age of litigation. 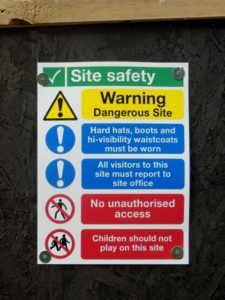 Thankfully the days are long gone where a business could take a laissez-faire attitude to health and safety and in fact more and more organisations are signing up to the Safecontractor scheme. For contractors who want to provide reassurance for their clients that health and safety is correctly implemented on their sites the Safecontractor scheme offers a system of health and safety audits. This government-approved scheme is open to all contractors and consultants who apply to work within the public and private sectors. These bodies are expected to meet health and safety standards as specified by the Health and Safety Executive. One of the great advantages of the Safecontractor scheme is that the contractor completes an extensive risk assessment questionnaire during assessment and, pending success, thus avoids having to repeat the process for each new client. The scheme helps to provide solid assurances about the competence and compliance of the contractor’s health and safety systems. What is assessed under the Safecontractor scheme? These are just some areas of assessment covered by the Safecontractor scheme. There are others not listed here which may relate to specific areas of business. What are the benefits of joining the Safecontractor scheme? Possession of a Safecontractor certificate is proof of your competence and compliance in health and safety regulations and procedures. As we said earlier, a main benefit comes in not needing to be assessed multiple times by every new client – this is a huge time and money saver. You will also gain access to a range of clients who support the Safecontractor scheme, of whom the numbers are increasing all the time. As a member of the Safecontractor scheme you will also have access to the Safecontractor web-based database where you can search for new clients. You will have the use of the approved Safecontractor logo and vehicle stickers, which will demonstrate your compliance and commitment to health and safety. And Safecontractor membership also provides you with constant support when you need it. With an increasing number of clients actively searching for contractors who can show Safecontractor accreditation can you afford not to be a part of it? For help and assistance on this call us on 01484 817 444 or email info@synergosconsultancy.co.uk – we’ll be happy to help you through it.